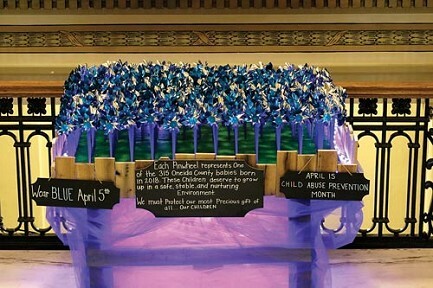 Visitors to the Oneida County Courthouse will find a display recognizing Child Abuse and Neglect Prevention Month. Each pinwheel represents one of the 315 Oneida County babies born in 2018. April is Child Abuse and Neglect Prevention Month as proclaimed by Governor Tony Evers. The month provides an opportunity to acknowledge the collective efforts of families, caregivers, communities, and agencies preventing child maltreatment. "The department and its partners across Wisconsin work daily to establish safe environments for children and families," said Secretary-designee Emilie Amundson said in a press release. "Establishing a commitment from the state to prevention efforts, through policies and funding, helps reduce the likelihood that abuse and neglect occurs in the first place. Gov. Evers' budget contains several positive changes that present a real opportunity for advancing our collective priority of keeping kids safe - specifically the increase in the Family Foundations Home Visiting program and the Children and Family Aids (CFAs)." An increase in CFA dollars is a longstanding request of counties across Wisconsin. The aid supports county child welfare costs, which have dramatically increased over the past decade while funding has remained flat. An increase in CFA aid allows counties to respond in a timelier and more effective fashion to child maltreatment allegations, thereby reducing the risk that maltreatment occurs and intervening faster when it does. The Family Foundations Home Visiting program currently reaches 31 counties and five federally recognized tribes. The program provides participating families services to improve parenting skills, school readiness, and child and maternal health. The program is evidence-based and helps prevent environments that lead to child abuse and neglect. The home visiting program is just one of the many strategies to reduce child abuse and neglect that succeed due to cross-agency partnerships. The Department of Children and Families (DCF) works alongside the Child Abuse and Neglect Prevention Board (Prevention Board) to recognize the importance of these relationships and to lift up local efforts. Together, DCF and Prevention Board recognized April 5 as Wear Blue day to raise awareness and support for promoting and strengthening child abuse prevention work. To learn more about child abuse and neglect prevention efforts, visit DCF's website, Prevention Board's website, Prevent Child Abuse Wisconsin's website, or your local human services department.